It’s HOME STYLE SATURDAY! Thanks, Lory for putting this group together. Please check out her gorgeous blog Designthusiam. 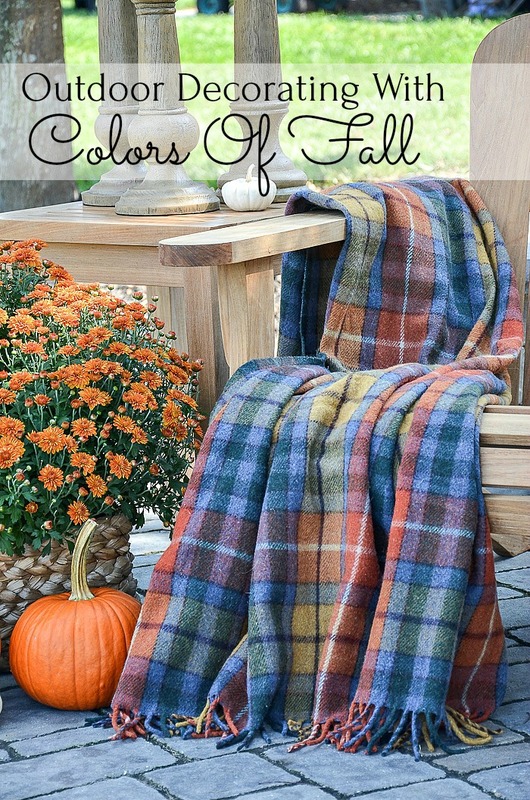 Today I’m sharing how to bring the colors of fall to your outdoor decorating. So let’s walk down to the fire pit where I have my new favorite chair! Our fire pit gets the most use from now until Christmas. It’s the perfect place to read or take a meal and enjoy conversation with family and friends! Even when it’s not lit it’s a little piece of heaven in our backyard! 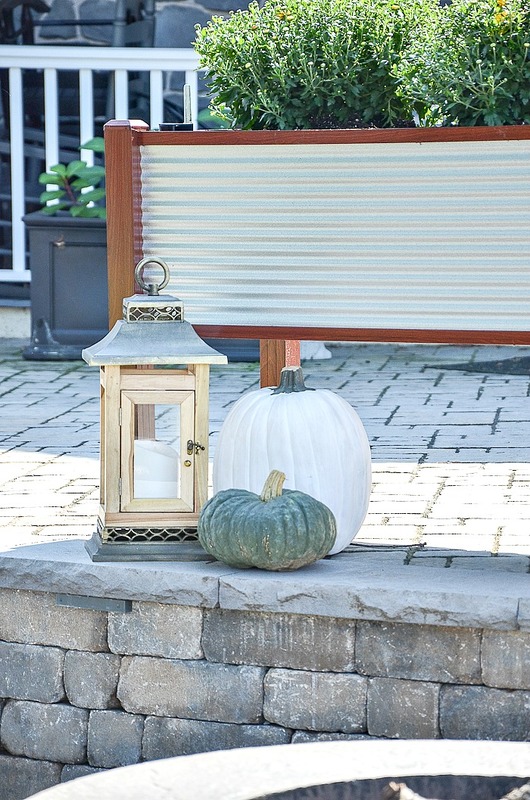 For me, the best way to add seasonal colors to outdoor decor by creating vignettes using touches of seasonal elements. Did you notice that the Adirondack chair and the table are very neutral? 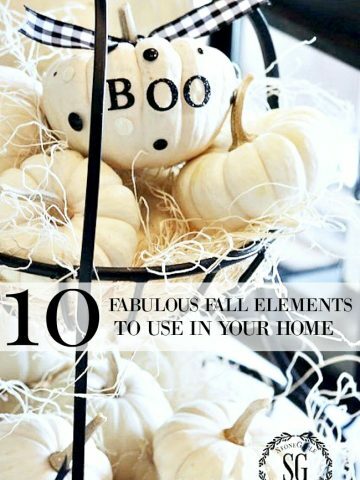 Yes, that way I can use them and change the decor around them all year! I mostly choose neutral foundational pieces because they are more versatile! 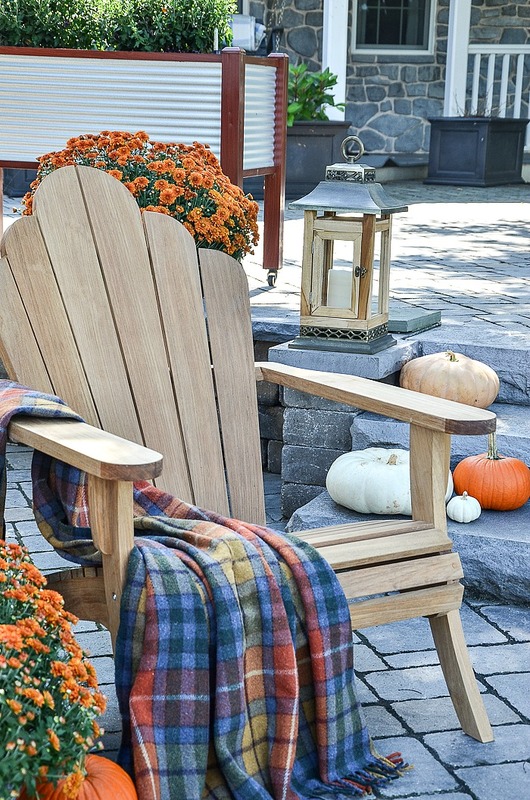 The Bainbridge Adirondack chair is perfection around the fire pit! This chair is so comfortable and deliciously crafted! I like to wrap myself in a tartan throw and relax! 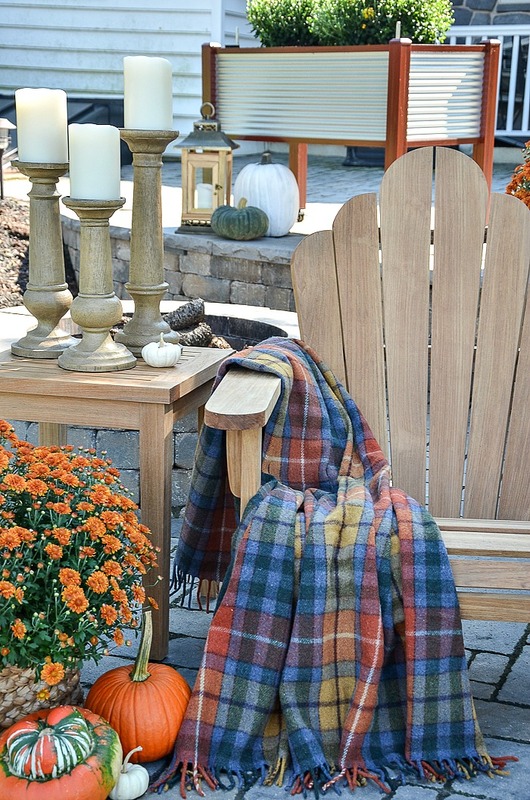 My well loved Tartan throw adds a big punch of fall color! And doesn’t it pair so well with the teak chair? 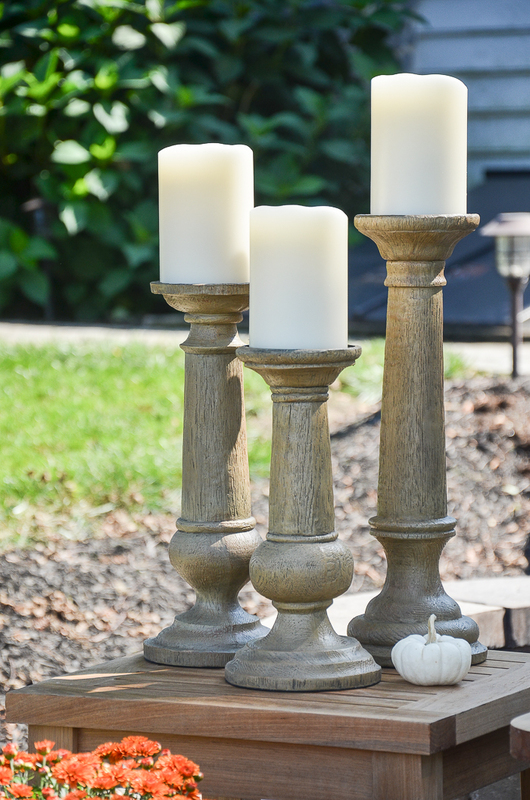 The teak side table holds a trio of rustic oak candleholders. And the candles are Miracle Flame Wax LED candles with remote controls. I LOVE these candles. If you are a candle user you will too! When it gets darker I can turn them on and they will not go out in if it’s breezy. And they look amazingly realistic! The juxtaposition of the neutral table and candleholders with the color arrangement under it create an area that is both restful and seasonally cheery! 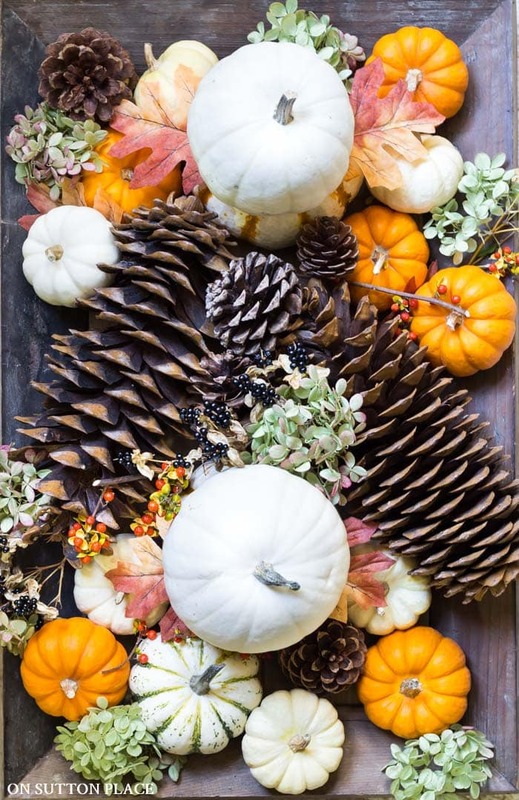 It’s so important to balance areas of calm and neutral with those bright and bold colors of fall even in outdoor decorating! 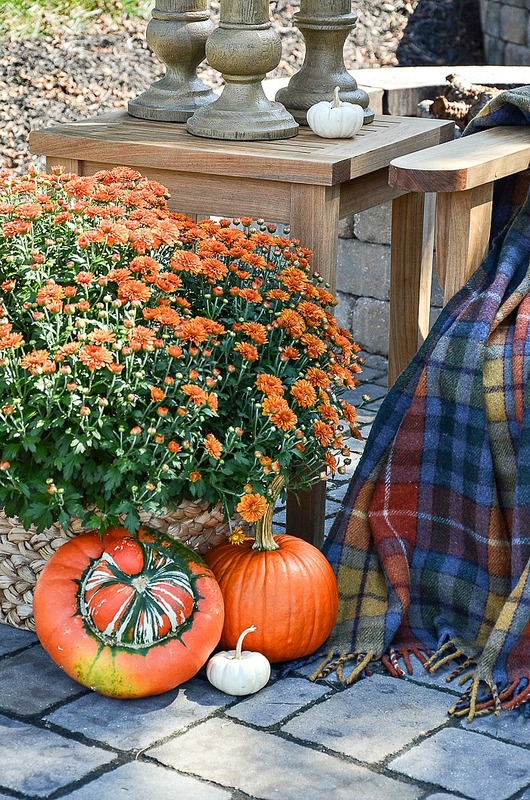 The mums were placed in a nubby basket and a trio of pumpkins sit next to it. 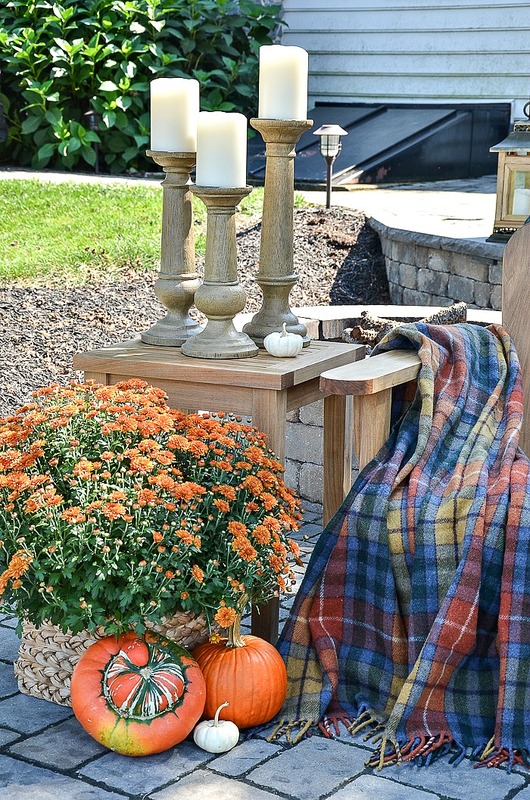 I like to add fall decor to the base of my foundational pieces like chairs and tables! Just a few fall touches makes this area festive and very usable! 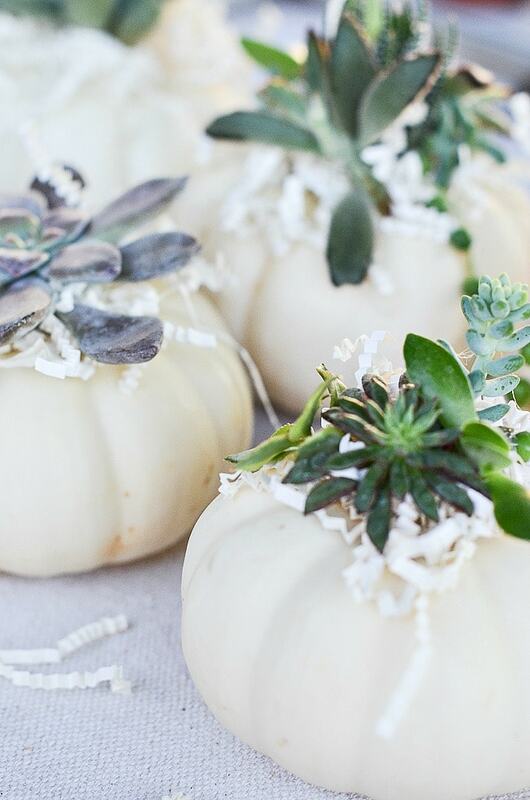 Wouldn’t a stack of pumpkins look great here too? 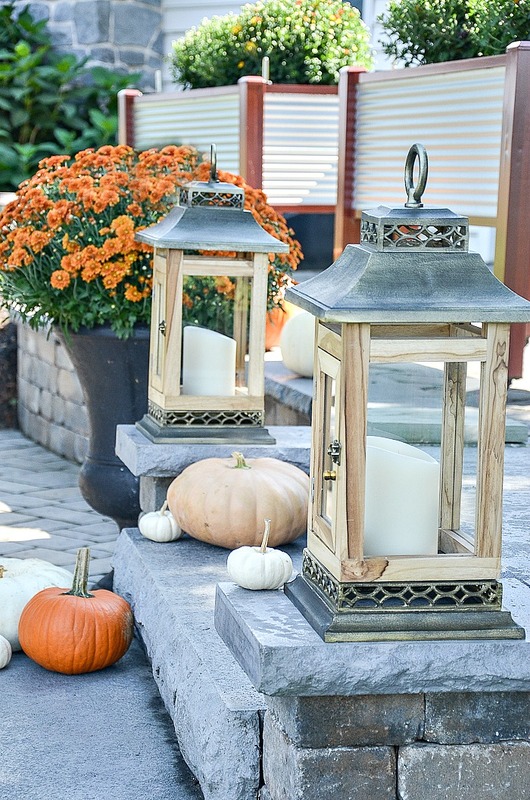 Two outdoor teak lanterns flank the stone stairs dotted with pumpkins in oranges and white! 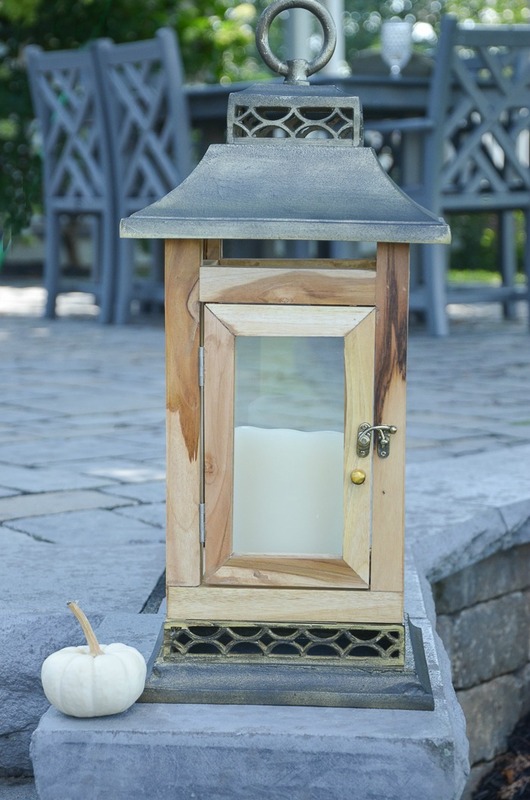 The lanterns, candles, and candleholders are part of Balsam Hill’s Fall Decor. I’m using the lanterns with the Miracle Flame candles to light the stairs this fall. I like using white candles in lanterns so when they are lit there is no other color in the lantern but the glow of the flame. Using fall colors is a balance. A little bit of color goes a long way! 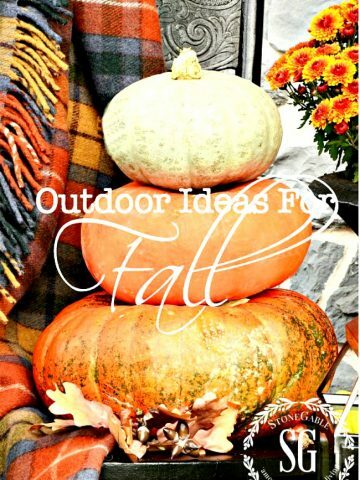 And just the right amount will make your outdoor decorated spaces fabulous! 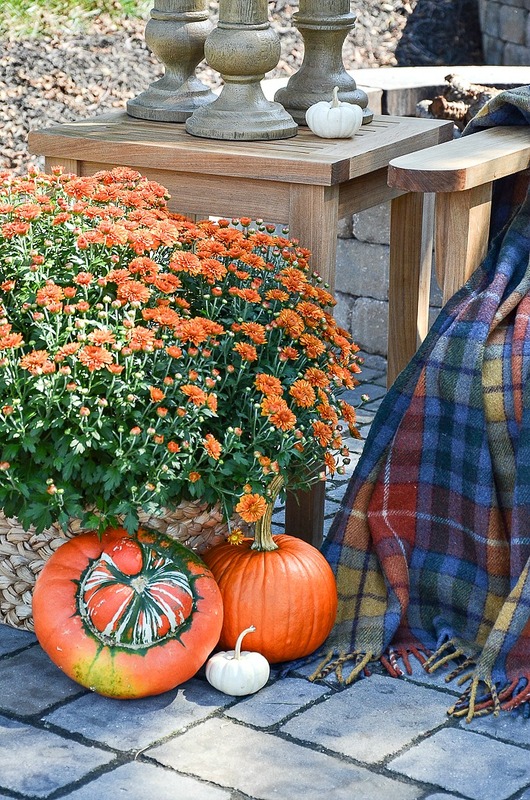 So, if you are thinking of adding a little bit of fall color to your outdoor decor I hope these simple tips have helped! A big thanks to the nice folks at Balsam Hill and Thos. Baker for sponsoring this post! 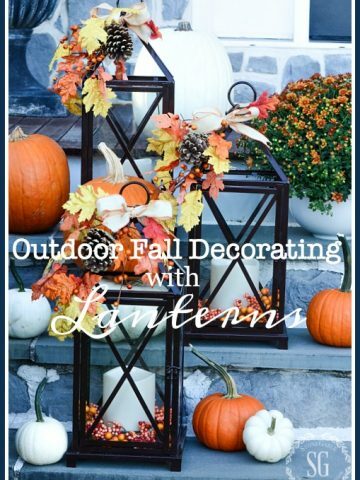 OUTDOOR FALL DECORATING WITH LANTERNS AND A GIVEAWAY! Love your outdoor space. Especially the corrugated and wood planter. Could you tell me more about them and where you purchased or were they handmade. Thank you. Yvonne, your back patio is beautiful, I can understand why you spend a lot of time there. 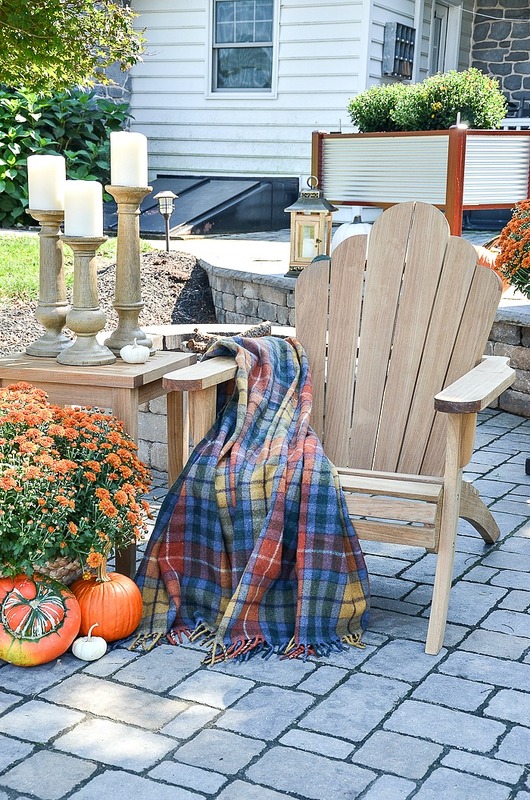 Love the tartan throw it’s gorgeous and Adirondack chairs are my favorite. I love the colors in your tartan throw! Does the pattern have a name? I don’t remember seeing much of your backyard…I’ll have to dig around your site. It’s lovely! Thanks to you, Yvonne, I pulled out a wool tartan stadium blanket that I won at a Breast Cancer Race for the Cure eons ago! Awesome ideas! Your outdoor living area is beautiful! I adore fall! Have a wonderful day! Absolutely LOVE this color combination. 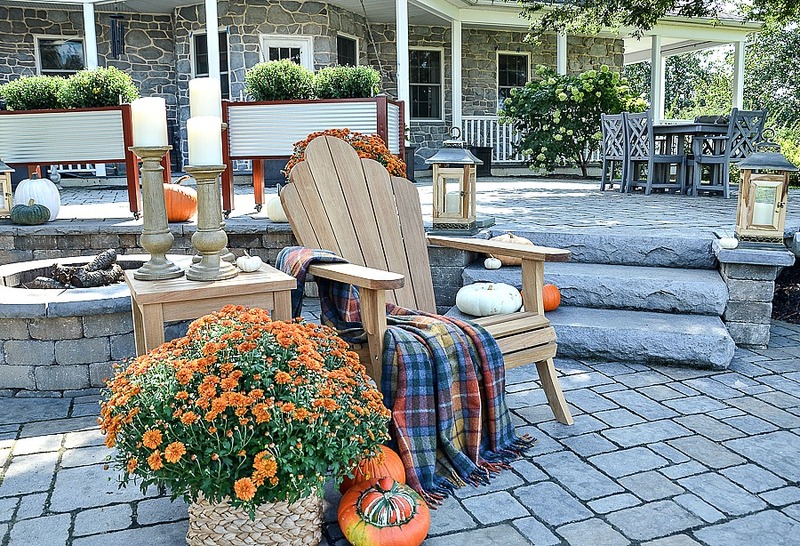 We have two adirondack chairs and I’m going to start looking for some fall pillows and throws for them. Yvonne, your tartan throw is gorgeous. Each time you post with it, I’m jealous! It’s a lovely porch this year. 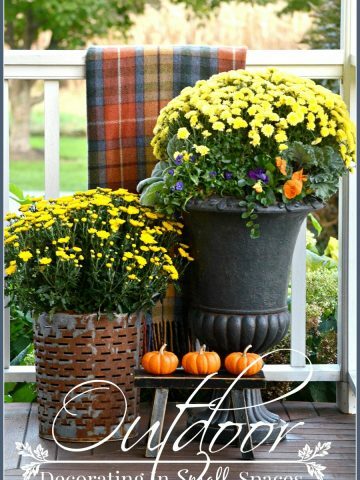 Absolutely LOVE Autumn…my favorite season…and absolutely love your fall ideas. The plaid throw is awesome!! 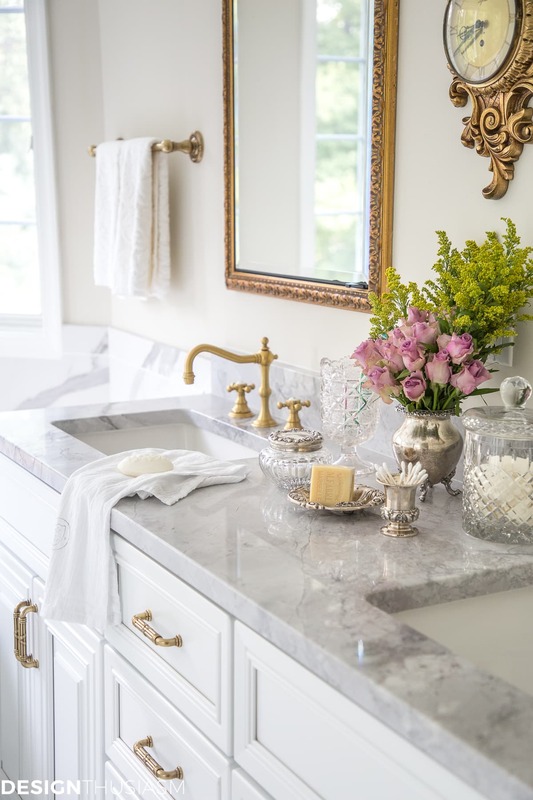 Love all the neutrals.I too am a lover of flameless candles and lanterns, they are scattered around my home adding that warm and cozy to the room. 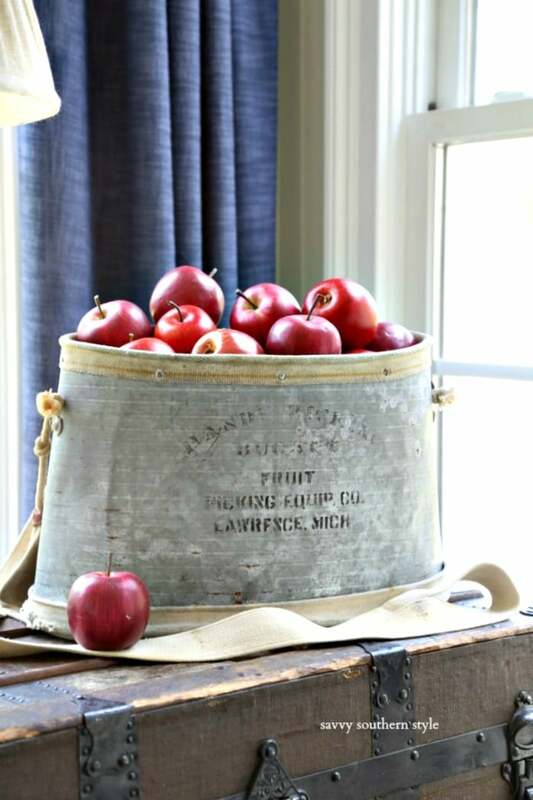 Yvonne, I do so enjoy and learn from your blog and this fall outside decor article is no exception. As a professional gardener, I do a significant amount of fall outdoor decorating for my clients. Your suggestions in this blog are helpful and spot on. I do want to humbly disagree with one item that you list as another item that would look nice with the lovely lantern and that is Bittersweet. I cannot begin to tell you how invasive bittersweet is in my home area of southern Michigan. It is taking over open spaces in parks, woodlands and even in downtown areas. The vines are so aggressive that they will at some point kill mature trees of any variety by covering the tree with the vine while it chokes and girdles the tree trunk. Birds eat the bittersweet seeds that are present in cuttings and disperse them. It’s such a shame because the bittersweet berries are SO perfect for fall decorating. But, I guess I am on a mission to spread the word that we must be vigilant not to spread the bittersweet. I so agree Pamela. I’m not suggesting planting it I am suggesting getting some cut or faux to add to a lantern. We can get it cut in our garden shops. Many states do not allow planting of bittersweet because of it’s invasive nature. Do you leave the tartan, lanterns and candles outside all the time ? Or do you bring the in or to the porch? Hi Cheryl, I don’t leave the tartan outside. It comes in and out with me. The lanterns are teak and are made to stay outdoors. As far as the candles, as long as it is not too hot or rainy I’ll leave them outside. Hope this answers your questions. Very pretty and cozy! The chair looks so comfy and well crafted. Thx for sharing!